Academic success is a choice. You have a choice as to whether or not you engage in behaviors that successful students engage in, such as attending class regularly, managing time well, actively studying enough time each week, and doing school work in a timely fashion. Students who do not choose to do these things many times experience unpleasant consequences as a result of doing poorly in their classes. Likewise, students who lack understanding of the policies and procedures that they need to follow while earning their degree can also lead to unpleasant consequences. While the university strongly encourages that all students read all sections of the General Information section of the online Undergraduate Catalog as well as their major college/department degree requirements, here are some of the most important policies to consider. At the end of each term, professors input final grades into the MyMav Student Information System, and the Office of Records makes the grades “official” for that term. At that time, the Office of Records calculates the semester and cumulative grade point averages (GPAs). Based on that information, an Academic Standing is posted that serves as a signal of the academic “health” of a student. The university requires that students maintain at least a 2.0 cumulative GPA to be in Good Standing. Students that earn less than a 2.0 cumulative GPA are not performing according to the standards set by the university, which results in an impact of their privileges and possibly the ability to continue taking classes at UT Arlington. The Table of Standards sets certain GPA limits based on the number of hours a student has accumulated. Freshman and Sophomore students who earn probation—those students with less than a 2.0 GPA but higher than the level for dismissal—are restricted to taking 14 semester credit hours until they raise their cumulative GPA to a 2.0 or above and come into Good Standing again. Academic departments may require students to develop enrollment contracts that specify courses and actions to take to improve academic performance. Once a student reaches the Junior and Senior levels, these students no longer have probation as an option and are simply subject to dismissals after one warning term. 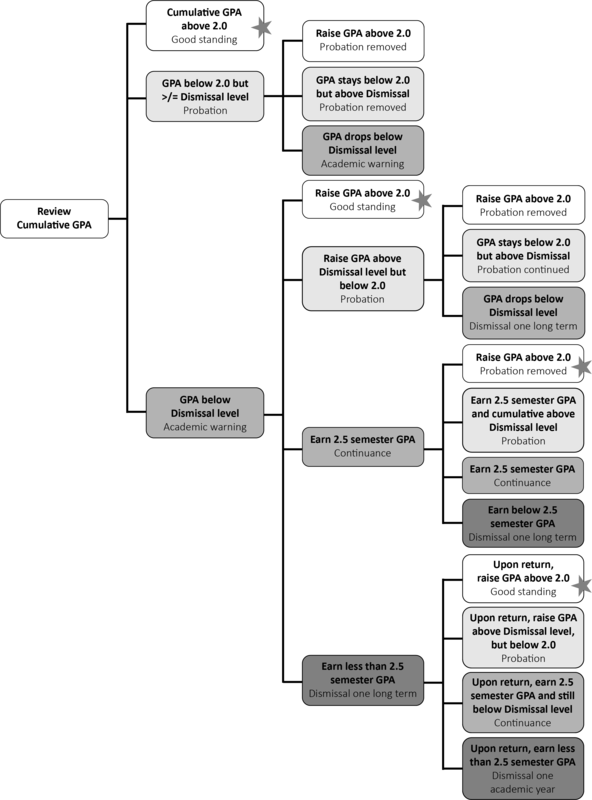 Students who earn cumulative GPAs at the “dismissal level” (i.e., GPAs listed in Table 6-1) for their classification are subject to dismissal and are required to sit out for a period of time after one warning semester. Students flow through a cycle of academic standings based on their semester and cumulative GPAs. Figure 6-2 illustrates some of the possibilities and complexities of this cycle based on semester-by-semester performance. Overall, students who earn an academic standing of Probation, Warning, Continuance, Dismissal 1: One Long Term, or Dismissal 2: One Full Academic Year should meet with an academic advisor in their department to discuss steps to improve future academic performance for the next term or after the dismissal period has elapsed. * Summer enrollment is considered as a separate term and would be added to the fall and spring and would change the minimum hours that needed to be completed. ** Unsatisfactory grades are letter grades of F, W, I, Z, and X and will not be counted in the credit hours completed but will count as attempted credit hours. Annually in May, the Office of Financial Aid reviews student records and notifies those students who have not met the requirements for Satisfactory Academic Progress. If students are deemed ineligible for future federal financial aid, they can file an appeal for future aid or reapply for financial aid when they come back into compliance with these standards. A financial aid counselor can meet with you to discuss this policy more in-depth if you have concerns. There are two common misconceptions that are important to discuss at this point. First, students who submit and are granted appeals for future financial aid sometimes believe that they are no longer subject to a dismissal period that they may be facing due to their academic standing. These two processes are independent; students who are granted an SAP appeal are not guaranteed enrollment for the next semester if they are on a Dismissal for One Long Term or One Full Academic Year. Also, advisors often hear from students prior to the Last Drop Date, “I cannot drop this course because then they will take away my financial aid.” However, the fact of the matter is that a letter grade of “F” has the same impact as a letter grade of “W” that is earned when you drop a course. It is important to weigh both the impact of a poor grade on your GPA and the number of drops accumulated toward your limit when dropping a course, not simply financial aid eligibility. When a registration period opens for future sessions, students are allowed to enroll in courses during a short window of time based on their classification and possibly other special factors. Refer to your MyMav Student Services Center for information about when your initial enrollment window is scheduled. Students cannot make adjustments to their enrollment until registration opens for all students again. At that point, students can make adjustments to their course schedules through the Late Registration period for a given session. The Academic Calendar will provide enrollment dates. After Late Registration, all add and drop procedures must be completed with the assistance of an academic advisor in your major department or Division of Student Success if you are a freshman student. To add a course after Late Registration, you will need to access a form and obtain permission from your major advisor and then seek final approval from the department that offers the course. However, students who have academic standings other than Good Standing are rarely allowed by advisors to enroll in a course after the Late Registration period. In addition, once Census day has passed, students cannot be added to classes as a general rule. Likewise, to drop a course after Late Registration, you will need to access a drop form that will ask you to get permission from your professor which is meant to be an opportunity for you to verify your course performance and gain recommendations for possible development that may foster future success in the course. Once the professor has approved dropping the course, you return to your academic advisor to have the course removed from your schedule. Courses dropped prior to Census date are removed from your transcript as if you never enrolled in them, while courses dropped after Census but before the Last Drop date for the semester earn a “W” for that course on your transcript and counts as an attempted course when considering financial aid eligibility, the Six Course Drop Limit, and Excessive Hours policies. While there are certainly consequences to dropping courses that need to be considered carefully, you need to discuss with your professor and your academic advisor early on if you are failing a course and need to consider dropping the course. Failure to drop a course can also have severe impacts on your grade point average that needs to be weighed as well. Students who do not drop a course prior to the Last Drop day must file an exception to have courses dropped from their semester enrollment and receive a “W.” In these cases, students must provide solid documentation and rationale for dropping past the Last Drop day for extraordinary, non-academic reasons. Students who are unable to reasonably complete any of their enrolled coursework for a given semester need to talk with an academic advisor about with- drawing from all of their courses. Too many times, advisors encounter students who come back to them some time later with a damaged grade point average, because they encountered a life event that impaired their ability to complete their coursework which resulted in all F’s for the semester. It is important that when serious illnesses or issues arise that you speak with your academic advisor about your options, which include withdrawing from courses rather than suffering the consequences after the fact. Beginning Fall 2007, undergraduate students are only able to drop six courses during their entire undergraduate career. After students have exceeded this limit, they will earn the grade for the course. The state legislature created this policy in essence to encourage students to successfully complete courses that they enroll in given that the state subsidizes your tuition dollars for coursework at public institutions like UT Arlington. It is important for students to meet with their academic advisors each semester to develop a realistic schedule of courses to foster success. For instance, if you know that you have a sick family member that you may have to help take care of, consider enrolling in fewer course hours that semester. If you have to work more hours to help pay the bills, enroll in fewer courses that semester so that you have time to give quality attention to the courses you are taking. Students who entered college Fall 2006 and after will experience a financial penalty—equivalent to the charge of out-of-state tuition—for coursework taken beyond 30 hours of their major degree plan. For instance, if your major degree plan requires that you complete 120 hours to graduate with a degree, you have 30 hours beyond that to take exploratory courses. At the point in which that student enrolled in 151 credit hours, he/she would begin paying out-of-state tuition for those credit hours. Once again, this policy was enacted by the state legislature to encourage students to enter college, settle into a major, and graduate with a Bachelor’s degree rather than simply accumulating a mass of credit hours from many different areas that do not result in earning a college degree. This policy should not discourage a student from taking a few courses that they are interested in or exploring different majors. Students need to be aware that if they are not successfully completing the coursework for a given major that they may need to consider changing their major (or making the proper life adjustments) sooner rather than later to avoid the financial implications of this policy. At UT Arlington, new freshman students, in addition to other special populations of students, will receive progress report grades during their first fall and spring semesters. E-mails are sent to your UT Arlington MavMail account indicating that progress report information is available online in the MyMav Student Services Center. Academic advisors also receive information about your performance in class. If you have any concerns about your academic performance it is important that you meet with your professor to verify your grade and what you need to do to improve your performance in the course. You should also meet with your academic advisor, who can put you in touch with resources on campus to help you deal with the issues that may be impeding your performance. Next: 6.5 Academic Integrity: Why Does It Matter So Much?